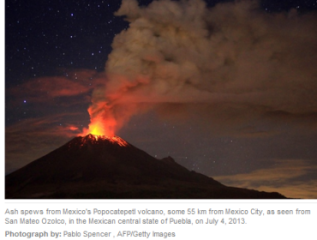 …volcanic eruption [Popocatepetl]! …and my 23rd wedding Aniversary! MEXICO CITY – At least six U.S. airlines cancelled 47 flights into and out of the Mexico City and Toluca airports Thursday after the Popocatepetl volcano spewed ash, steam and glowing rocks, airport officials said. Mexico City airport spokesman Jorge Gomez said U.S. Airways, Delta, United, American and Alaska Airlines cancelled the flights as a precaution. But he said the airport otherwise continues to operate normally and that by Thursday afternoon no ash had reached the area, about 40 miles (70 kilometres) northwest from the volcano. Gomez said that among the routes affected by the cancellations were flights to Houston, Dallas, Denver, Phoenix, Chicago and Los Angeles. At nearby Toluca airport, Spirit Airlines cancelled flights from Dallas and Fort Lauderdale, said spokesman Alejandro Munoz. …we just had a small Earth “crust” adjustment…! WHAT COMES OUT MUST GO IN…! OR ELSE…! No other “coincidences” to mention that i know of, for the day…! Only that it is my Wedding 23rd anniversary…! I WAS WEDDED IN Venezuela, and since not many think much of me or my wife, or cannot believe that we are here in Canada…! Or worse think too much of me or about me IN JEALOUSY…! NOBODY IS A MERE “FLEA”…! AND I SURE AM MORE THAN A FLEA…! ← …UBC School of Theology…! Blocking further human progress in logic and knowledge…?